ARTiculatedshade's 13' Aspen closed over a high-top dining set. Who hasn’t tangled with the folds of a patio umbrella during operation or peered around a closed umbrella during a conversation? We know the frustrations caused by the ribs of traditional umbrellas falling directly along the length of the pole and operating systems keeping us unavoidably in the path of those ribs. The larger the umbrella, the lower the ribs fall, and the more of an obstruction they become. With a patented system of laterally articulating ribs, ARTiculatedshade has redefined the boundaries of collapsible shade. 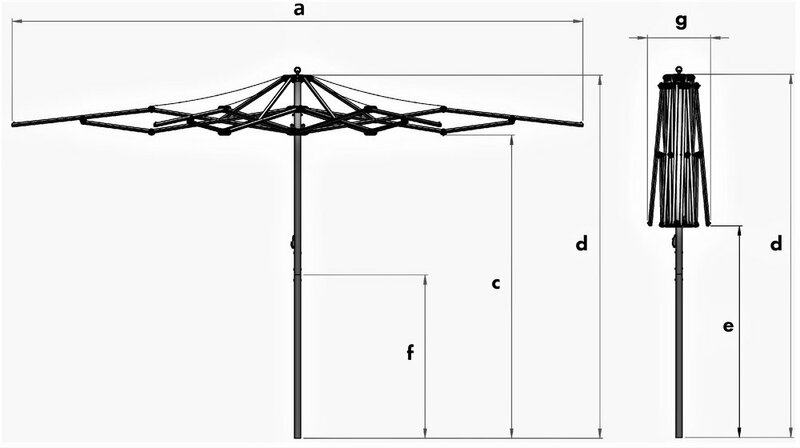 The Compact Patio Umbrella challenges preconceptions of patio umbrellas and liberates coveted space below the canopy that would otherwise be obstructed. Unlike common umbrellas that often obstruct conversation, ARTiculatedshade umbrellas are designed to inspire conversation with detailing that is kept simple and clean to complement the inherent beauty of articulating shade. 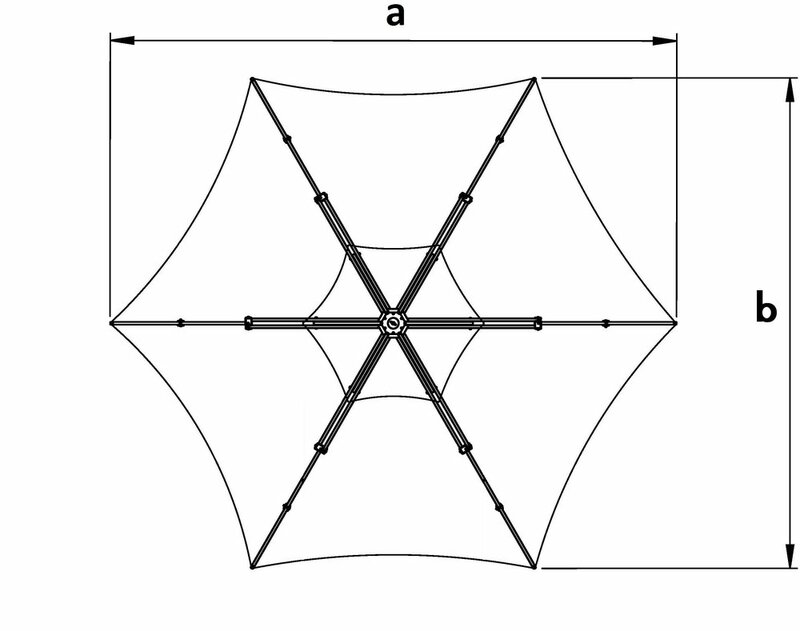 ARTiculatedshade umbrellas use shorter rib segments than traditional umbrellas. Shorter rib segments allow for greater clearance between the ground and the closed umbrella, which in turn allows for larger umbrellas that clear, not only the furniture, but the heads of guests seated at the furniture. The compact frame redefines the space an umbrella occupies and the time you interact. Open a table umbrella now with ease when desired, rather than out of necessity. All parts are designed to be durable and easily replaced for value through longevity. Though a little care goes a long way to avoiding damage to any umbrella, accidents do happen. And when they do, authentic replacement parts will always be just a click or phone call away. Side by side comparison showing two 13 foot canopies - one without ARTiculatedshade's compact frame and the other with ARTiculatedshade's compact frame.